Can Pixar do no wrong? The first two Toy Story movies were brilliant pieces of animation that were game changers not only in the family genre but for movies all around as they found the perfect mixture of kid friendly fun while still managing to pull adults into it just as much and perhaps even more with the release of the latest (and I would assume last in the franchise), Toy Story 3. However, Pixar also proves they are hardly a one-trick pony releasing several popular animated films from The Incredibles to Finding Nemo to Monsters Inc. and finding success each time with maybe only Cars delivering their only disappointment, although even then Cars was still an entertaining flick. Kids loved Toy Story 3, of course, but it has been 15 years since the first movie and those who were 10 years old or so when that was released probably have families now and taking their own kids to see this and in turn was far more invested in the story than I think the younger viewers were. Speaking for myself as someone who does not have kids, I found myself emotionally invested in these characters that I first watched when I was around 15 and doing the math, at the ripe old of 30, it was bittersweet to see these characters say goodbye brought something out that not many films do with me. Back to Pixar and their god-like presence in the movie entertainment business, beyond the stories they tell that both kids and adults can have fun with they also gather some of the best voice talents that rather than going for a star (see: Will Smith and Angelina Jolie for Shark Tale) find somebody who embodies that character. That’s what we have (and have had) in the Toy Story franchise nabbing Tom Hanks and Tim Allen headlining a perfect supporting cast that has consisted of Don Rickles, John Ratzenberger (if anyone should receive an Oscar for voice work, he should be the frontrunner), Wallace Shawn, Kelsey Grammer, Joan Cusack, Wayne Knight and newcomers for Toy Story 3 with Ned Beatty and Michael Keaton in a hilarious role as Barbie’s counterpart, Ken. The story this go around takes place about 11 years after Toy Story 2 with Andy leaving for college and the toys, what’s left of them, are anxious to know what will happen to them and hoping they will go to the attic to live out the rest of their days (though I would presume they live forever…) and while Andy has packed them all up in a garbage bag to go to the attic – save for Woody who he has chosen to go to college with him – through an accident they are placed out with the trash with the garbage truck on its way. They manage to escape and believing Andy meant to throw them away – and despite Woody trying to tell them otherwise – they hide away in a donation box headed for Sunshine Day Care. Upon their arrival the place looks like a paradise: cheerful fellow toys and most especially, never ending kids who will play with them that when they grow older, a new set of kids come in so no more of the heartbreak they experienced with Andy. However, something more sinister is afoot when they go from what is called the “Butterfly Room” with nice kids to the “Caterpillar Room” with the toddlers who wreak havoc on the toys. Woody managed to escape beforehand but upon hearing about their predicament, returns to help save the day. Obstacles, laughs and bittersweet moments follow. I already covered the voice talents but I must still give props to Tom Hanks and Tim Allen as they could’ve easily sleepwalked through a project like this given they’ve played these characters twice before (and in the case of Allen, in a few Buzz Lightyear DTV movies/programs) but you still get that friendship that resonated so well for Toy Story 2 especially and the relationships with the others like Rex, Hamm and Mr. and Mrs. Potato Head. Simply put, it’s brilliant casting. While I said Toy Story 3 will be the last of the series, I should amend that to say that it should be the last not because I don’t believe Pixar couldn’t top this or even be right up there with it but because it ended on the perfect note, a more than satisfactory ending that was indeed bittersweet but did not go into the sappy realm that can plague some family oriented films. Overall, Toy Story 3 isn’t just a satisfactory end to a franchise (like Back to the Future Part III or Return of the Jedi) but instead is a brilliant film in its own right. Pixar might have stumbled a little with Cars, but their track record thus far is easily an A+. Day & Night Theatrical Short (6:02; HD) – The short film that appeared before Toy Story 3 in theaters has been included here and is just as fun as it was when I first saw it. It also looks pretty good on the small screen although the 3D version looked fantastic. Buzz Lightyear Mission Logs: The Science of Adventure (4:25; HD) – These featurettes were made in conjunction with NASA and other editions were included on the Toy Story 1 & 2 Blu-rays. It’s a fun featurette for the kids to watch and learn about space and what they do. Toys! (6:39; HD) – How many toys are in the film? Members of the crew talk about rebuilding the old characters (because of advancements in technology since Toy Story 3) and creating new ones. The Gang’s All Here (10:24; HD) – This featurette goes over the cast from the old crew to the newcomers including Ned Beatty, Michael Keaton, Whoopi Goldberg and Jeff Garlin. I always enjoy the features where we get to see the actors recording their lines as well as getting their insights into voicing the characters (and the grunts they have to do). A Toy’s Eye View: Creating a Whole New Land (5:29; HD) – The featurette isn’t about creating the day care center but instead is a sneak peek at the Toy Story-themed playland at Hong Kong Disneyland. Epilogue (4:22; HD) – This is the footage shown during the end credits but larger. Paths to Pixar: Editorial (4:40; HD) – Similar to the “Setting Story in Motion”, this featurette focuses on the editing process from editors at Pixar and how they go about cutting a film. Studio Stories (TRT 7:03; HD) – There are three stories included and if you don’t know what a “Studio Story” is, it’s a simple animation narrated by an employee at Pixar relaying a story. Here’s the breakdown – ‘Where’s Gordon?’ (2:18), ‘Cereal Bar’ (1:38) and ‘Clean Start’ (3:07). These are fun stories that are worth checking out. I enjoyed the ones that were included on the Toy Story BDs. Lastly, disc 4 contains the DVD Copy that includes all the features not marked “Blu-ray Exclusive” (duh) and disc 5 has the Digital Copy (** Blu-ray Exclusive **). On the third disc is also a BD-Live portal (** Blu-ray Exclusive **). 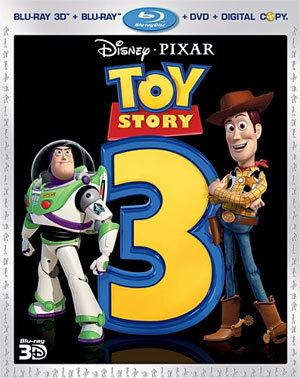 Toy Story 3 arrives in 3D on Blu-ray presented in 1.78:1 on a 50GB Disc. So many would think the newest film would look best in 3D, right? Wrong. When I saw this film in theaters (presented in 3D), I was very disappointed with the 3D as it was hardly used aside from a few gimmicky shots. That’s the problem. 3D should be natural, especially in a film like this. Not shoehorned in to get an extra $3 a ticket. At least with older films being converted we know they were not made with 3D in mind, but this one was. In something I haven’t seen before, the Blu-ray comes with two DTS-HD Master Audio tracks: one with 7.1 channels, the other with 5.1 EX and both sound amazing to my ears but the 7.1 channels obviously gets the nod with a more expansive audio experience. One wouldn’t expect a whole lot from an animated feature but the opening of course has the great train robbery with plenty of explosions that will rock your windows, floor and walls while the quieter moments are easy to understand but not too loud, so no volume adjustments with this one. Overall, Toy Story 3 is a heartwarming, bittersweet and funny film that both kids and adults will absolutely love – and I would argue that the adults may find a more emotional impact especially if you were a child when the first film was released. The 3D Blu-ray itself has incredible video and audio which is to no surprise for a Pixar/Disney release and the features has something for both the young and old, although geared mostly towards adults. I would not hesitate to recommend you buy this disc immediately.